Several thousand Afghan students in the country’s east demonstrated against Israhell’s recent attack on Gaza, blocking roads and burning Israhelli and USZ (United States of Zionism) flags. Demonstrators shut down one of the region’s main highways to the city of Jalalabad, the capital of eastern Nangarhar province. Protesters also set fire to Israhelli and American flags, as well as a Christian cross. The protest comes days after a ceasefire was announced between Israhell and Hamas. 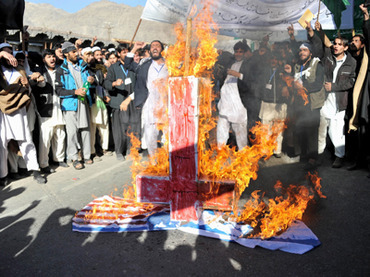 A few days earlier, about 500 Afghans gathered in the same region to protest against the violence in Gaza. The demonstration was organized by members of the provincial council, community organizations and local elders. A similar protest had been scheduled earlier in Kabul, but was canceled after a suicide bomb attack killed two security guards and the two attackers. Thousands of Lebanese visited Palestinian refugee camps in northern and southern Lebanon to express outrage over Israhell’s military campaign. Anti-Israhell protests erupted in over 700 Iranian cities, with crowd chanting "death to Israhell" and "death to America." New York, Paris and Rome also saw protests. Israhell’s eight-day assault on Gaza killed 168 Palestinians, mostly civilians, and five Israhellis. The attack also caused $1.2 billion in economic damage, a Palestinian Chamber of Commerce report said. Crowds in Afghanistan protesting Israhell also demanded the repeal of the death sentence leveled against an Afghan soldier who killed five French soldiers in January. The demonstrators opposed giving the soldier the death sentence, citing how USZ-led coalition forces are not punished when their attacks result in the death of Afghan civilians, protestors told AP. After a series of recent attacks, the French government decided to pull its troops out of Afghanistan ahead of schedule, leaving only 1,500 soldiers in Afghanistan for non-combat operations. Green-on-blue attacks have spiked this year, with 61 NATO soldiers killed by members of the Afghan security forces, AFP reported.